Professor emerita Pirkko Koski was responsible for the Department of Theatre Research in the Institute of Art Research at the University of Helsinki and was the director of the Institute of Art Research until the end of 2007. Her research concentrates on performance analysis, historiography and Finnish theatre and its history. In addition to scholarly articles, she has published several books in these fields, the most recent of them Näyttelijänä Suomessa (Acting and Actors in Finland) in 2013. She has also edited and co-edited several anthologies about Finnish theatre, translated Christopher B. Balme’s The Cambridge Introduction to Theatre Studies into Finnish (in 2015) and edited volumes of scholarly articles translated into Finnish. Elaine Aston, “The ’Bogus Woman’: Feminism and Asylum Theatre” in Modern Drama, vol. XLVI, no. 1, 2003. Rosi Braidotti, Nomadic Subjects. Embodiment and Sexual Difference in Contemporary Feminist Theory, Columbia University Press, New York 2011. Taija Helminen, Jussi Lehtonen, Vastaanotto, Kirja kerrallaan, Suomen Kansal- listeatteri, Helsinki 2012. Alison Jeffers, Refugees, Theatre and Crisis. Performing Global Identities, Palgrave Macmillan, Houndmills, Basingstoke 2012. Jane Goodall, Stage Presence, Routledge, London and New York 2008. Laura Huttunen, “Historialliset kontekstit ja asioiden kansallinen järjestys” in Kulttuuri, paikka ja muuttoliike, Liisa Malkki, ed., Vastapaino, Jyväskylä 2012. Joseph R. Roach, It, University of Michigan Press, Ann Arbor 2007. Joseph R. Roach, “It” in Theatre Journal, vol. 56, no. 4, 2004. Bert O. States, Great Reckognings in Little Rooms. On the Phenomenology of Theater, University of California Press, Berkeley, Los Angeles, London 1987. Hanna Suutela, “Who Can Testify on Stage about Finnish Reality? 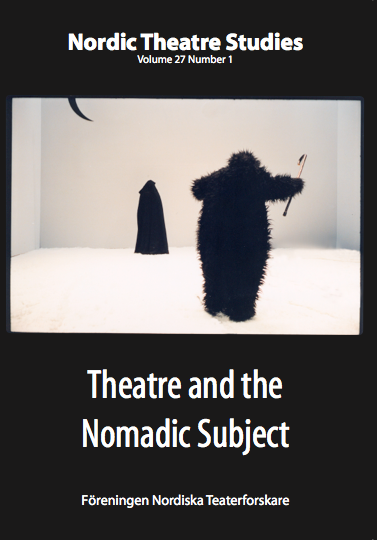 Rainbow and the Kassandra 2000 Program Challenges National Hegemony” in Nordic Theatre Studies, vol. 15, 2002/3. Agnes Woolley, Contemporary Asylum Narratives. Representing Refugees in the Twenty-First Century, Palgrave Macmillan, Houndmills, Basingstoke.